We are back again this week with a super fun and easy craft brought to us by our good friend Katie Fermia. 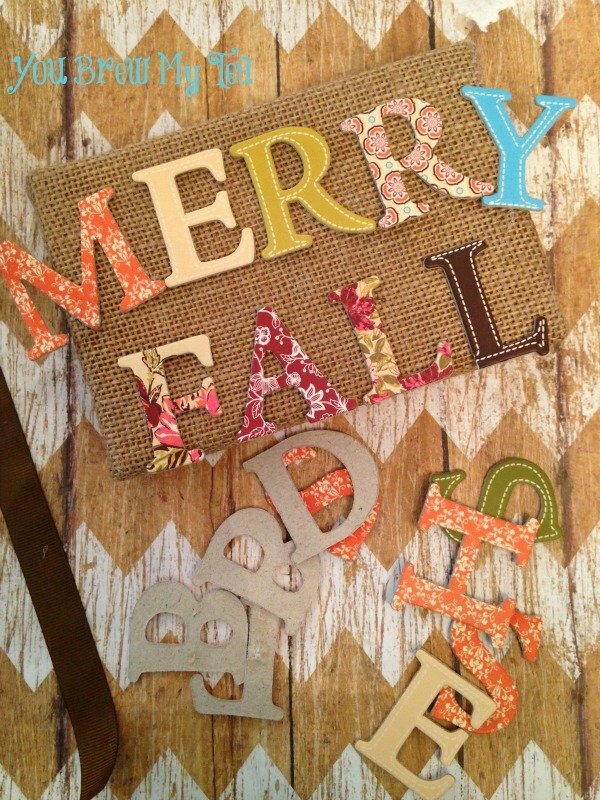 I love that she was generous enough to share her tips on how to make this fun Merry Fall Door Hanger! This is a perfect craft to do with the kids and hang on your door for the Fall season. Not only does it work for pre-Halloween and Halloween but Thanksgiving too! Let’s take a look at what she came up with for us this week! It’s fall! That means it’s time to whip out the fall décor and get your space looking cozy. You don’t have to spend bucks getting your home decked out; in fact, why not try creating some décor yourself? You can craft a Merry Fall Door Hanger just like the one you see here for just a few dollars and in just minutes. 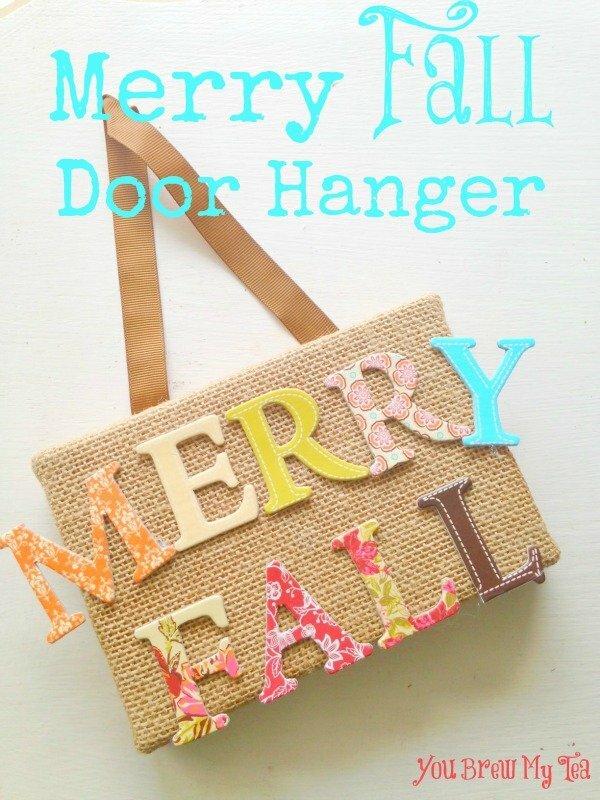 Take a look below so you can see how easy it is and get started on a Merry Fall Door Hanger for yourself. We found everything we needed here at our local Michael’s store. Check the bargain bins for chipboard letters in a variety of colors and patterns. You may also want to check out your local Dollar Tree, Hobby Lobby or even Walmart for great inexpensive crafting supplies. Begin by fishing out the letters you will need for this door hanger. Lay them out in order so you can make sure you like the color and pattern choices. Now, practice placing the letters on the canvas frame. This way, you can get an idea of spacing. One at a time, remove the chipboard letter and add some glue to the back of it. Press the letter to the canvas. Be sure you press firmly so the letter adheres well. Feel free to let the letters carry over the side of the canvas a little. Now that the words are in place, you can add your ribbon. Cut a length of ribbon and use the glue to adhere it to the back of the canvas. Once your glue is dry (on both the letters and the ribbon) you can display your door hanger. How sweet would this piece look hanging from an office or bathroom door? 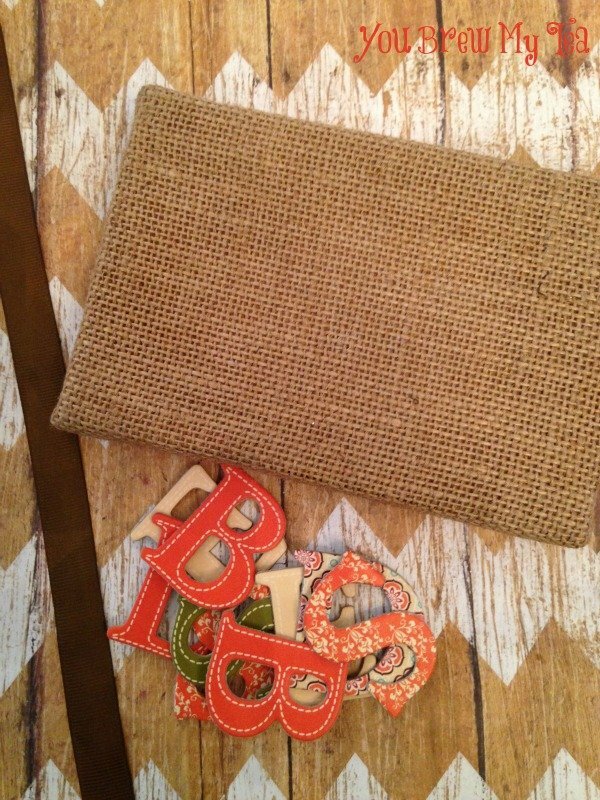 You can even hang it on a hook if you wish and display it anywhere that you can use some fall fun. This could also be very easily personalized with your last name, or made just for your kids teachers with their name to hang in their classroom! Katie Femia is an author, freelance writer, and sushi addict. She loves getting crafty and thrift store shopping. If she can get crafty with something she found while thrifting, it is a great day! You can find out more about her at www.katiefemia.com. I love this! Thanks for linking up to handmade in the heartland! I love this idea! I’ve got to go and get some of those letters to make one of my own.